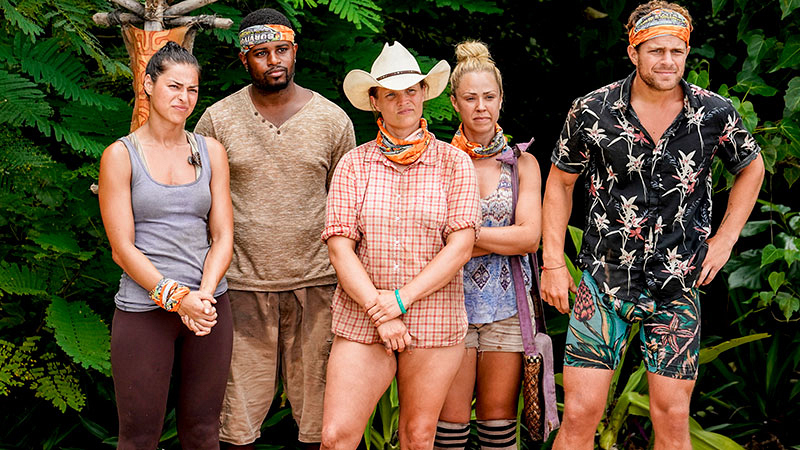 We caught up with the latest castoff from Survivor: David vs. Goliath about what went wrong for their game. 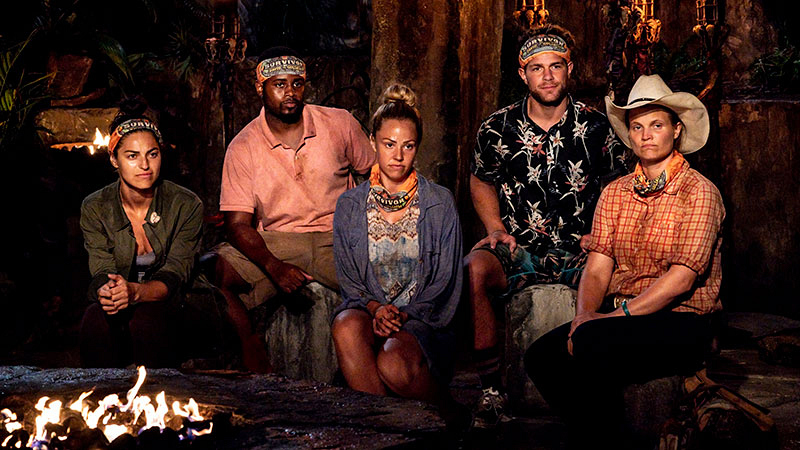 In Survivor, a Tribe swap can mean only one thing: all bets are off. So when the time came for the castaways of Survivor: David vs. Goliath to drop their buffs, it was clear the split into three brand-new tribes would test relationships, forge new friendships, and introduce unforeseen advantages into the game. But what no one could see coming was that for one unfortunate Goliath, it would also brew an epic blindside. Natalia felt confident in her relationship with former Goliath Tribe members Alec and Kara when the trio split off into the newly formed Vuku Tribe, along with Elizabeth and Davie, but her plans to vote out one the former Davids went horribly awry when Alec decided to flip the vote. We caught up with the 25-year-old industrial engineer—and first castoff following the Tribe swap—about what went wrong at Vuku, her temper, and dealing with the brutal Fijian weather. 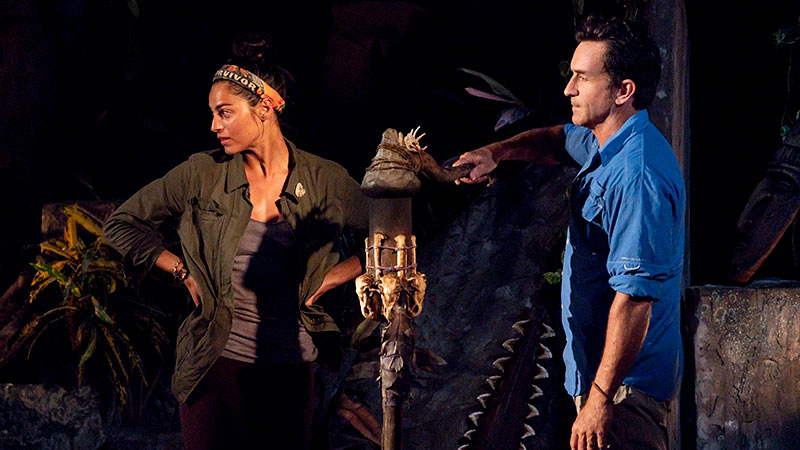 Starting with the tribe swap, what was running through your mind when Jeff told everyone to drop their buffs? Natalia Azoqa: I was really nervous like everyone else. I just wanted someone I could work with. And, obviously, when I saw Kara and Alec, I thought, "These are people that I'm close with." I was elated. We saw you get a little nervous when Kara hit it off with Elizabeth. Where do you think that paranoia stemmed from? Natalia: It started early on. On the Goliath Tribe, you see that I am working with Angelina and Kara very closely. We talk about a six [person] alliance with the three guys: Dan, John, and Alec. We say how each one of us has one of the guys. And Alec, I thought I had him in the beginning because I was working with him. That was our goal, to work with them. But I tried talking strategy with Alec a lot and we kind of had a feeling there was going to be some sort of swap coming up. You have to assume that, going into Survivor. We had a feeling it was going to happen, so a lot of us were trying to prepare for that swap. I remember speaking to Alec and getting his thoughts on where his head was at and who he wanted to work with, and he really wasn't giving me anything. He did not want to work with the six of us. So I asked him who he planned to be working with so we could make a move with these people. I really wanted to see where his head was at, but he was not willing to open up to me. So going into Vuku I actually was kind of happy because I thought, "Okay, this kind of enforces the relationship between the three of us." We had to work together because we knew Carl, a David, was going to come in. It was like we had to stick together at that point. But, very early on—the second we got to camp, almost—it was like, the girls are going to look for crabs and talk by the beach, and the guys are gonna go find fish in the water. So we were separated by gender and that really made me upset because the one person I wanted to stay close to was Alec because I had these doubts about him going into Vuku. I already knew I was very close with Kara, so I didn't really want to be walking with her and Elizabeth at this time. I was already annoyed, but I can't show them I'm annoyed, and then I see Kara and Elizabeth hitting it off. I got more annoyed. I was like, "Hold on a second. Kara is my person! Why is she now hanging out with Elizabeth like they're close?" Then I really started to freak out and I felt out of place, and you see that. Jumping to that crazy Tribal Council, what was the first thing that came into your mind when Alec started whispering in Elizabeth's ear? Natalia: Honestly, I was like, "This is real. He really does want me out." I felt it and I tried confirming with them a couple of times. At that point, I was mad at myself. I was like, "Why did I let this happen? 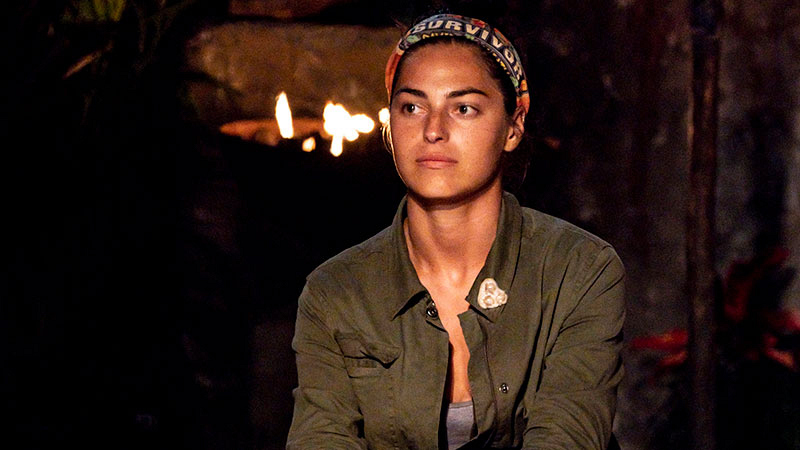 Why didn't I make a move before getting to Tribal Council when I had these doubts?" And when I saw him talking to Elizabeth, it just confirmed for me that he wanted me out. I really was trying to calculate the best way to go about this and that's what you see me thinking. Why do you think Alec decided to flip? Natalia: [Laughs.] Well, you see my aggressive side come out at Vuku. Honestly, it was the doubt I had in him. He knew I didn't trust him. It's because he never gave me a reason to trust him and I had to keep asking for reassurance because I didn't have that trust. I think the fact that I kept coming to him with doubts made him more annoyed. It was that moment when I woke them up from sleeping [right before Tribal Council] and you see me telling them to go back to sleep. It's because I knew I was bothering them. That was my last shot to really make a difference and confirm my feelings were [justified]. [And] that was the move when Alec was like, "Okay, she's crazy. I need to get her out." That must have been it. You said at Tribal you'd be happy if you went out guns blazing. Do you feel like you did that? Natalia: [Laughs.] Oh, for sure I think I did that. I don't think I went out lightly at all. I think I said everything I needed to say and I was very forceful in my exit, which is who I am. I'm very dramatic when I'm upset, so that's what you see. As you were leaving, Kara told you point-blank she didn't know about Alec flipping. In that moment, did you believe her? Natalia: I wanted to believe her, but in my head, I was like, "How can she not see it?" It was so clear as day. That's why I had to keep asking for reassurance because I just didn't know how she couldn't see it. 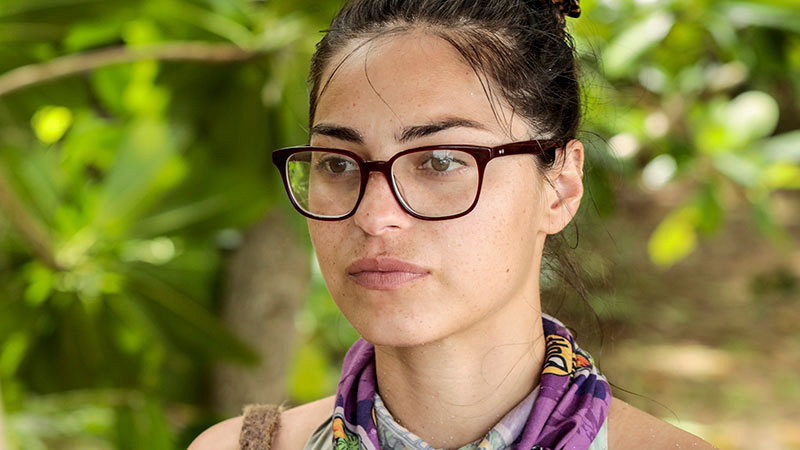 She was supposed to vote for Davie and I thought she stayed with the vote to trick me and that last moment when I reached out to her and said, "Hey, Kara, did you know?," it was because I was questioning our friendship at that point. For her to be honest in that moment, I knew she really did have my trust and had no idea about it. Watching the episode back, do you think there's anything you should've done differently when the new tribe got back to camp? Natalia: I should've tried to connect with Davie more. Maybe I could've gotten him to say something to me. I wish that I didn't act so crazy. It's just so hard because I was having those doubts, and I know I was right to have them because he really was wanting me out. When you're pressed like that for time and you know something is going to happen at Tribal Council, you're most real side comes out. That's where all that anxiety and frustration comes out. I wish I could've held it back and been a little more cool about it, but I just couldn't. Maybe, if I get to play again, I'll learn how to control those emotions. But they come out so strong and it's very hard to control them. Did you have a longterm strategy in mind back when you were with the Goliaths? Natalia: To be honest with you, I was very open. I was open to doing a lot of things in this game and working with a lot of people. I wanted to keep a really friendly relationship with a lot of the Goliath Tribe members because I didn't know what was going to happen in this game and I wanted to have a good rapport with everyone. You don't get to see that a lot, but I really communicated with a lot of the people and I was very social with almost all of those Goliath members. My strategy was just, "Okay, [Angelina and Kara] are my two girls. I know we're very open and honest with each other, so what can we do to move forward in this game?" Initially, we got up to six. Us three girls and the three guys. But it became clear to me that I was never gonna pull in Alec, and that was right before the swap. I thought maybe the swap would change things, but it didn't. 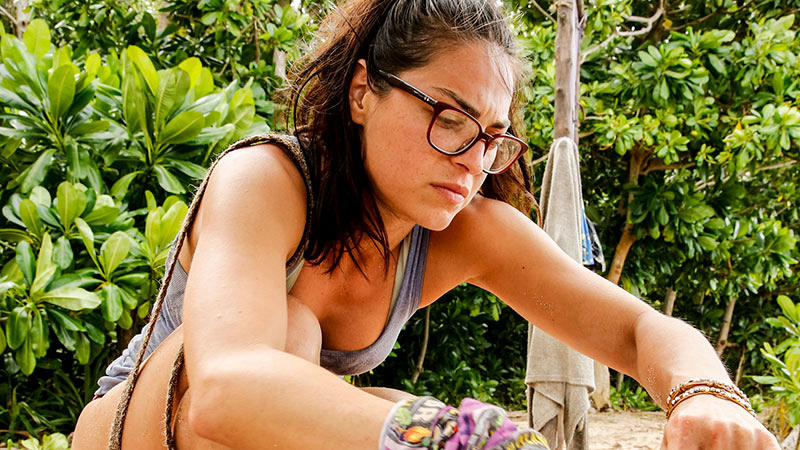 How did your expectations of Survivor compare to actually playing the game? Was anything easier or harder than expected? Natalia: The weather was so much worse than I anticipated. I really couldn't have imagined anything worse than that. I was really at my breaking point of having a mental breakdown. I'm surprised I didn't actually break down and cry. I thought it would happen, but it didn't. And the relationship that all the Goliath [members] had with each other, that's also something I wasn't expecting in the game. I didn't expect to get along with everyone so well and I didn't expect to just have a really good time, even in the worst conditions. So, that's something I thought was fun about the game and I'm really happy I got to be a part of that tribe. Going into Vuku—and this is also something I didn't expect—the game shifted so much. I know we see it a lot on the show, but being in that scenario is so real and your emotions really get tested. I went from a really big tribe where we were dominating and I felt really comfortable with the people. And then, all of a sudden, to be exposed on the Vuku Tribe, it's like, "Woah! Now I really have to test these relationships with people I thought I could be close with." That was a big shift that I was not expecting. 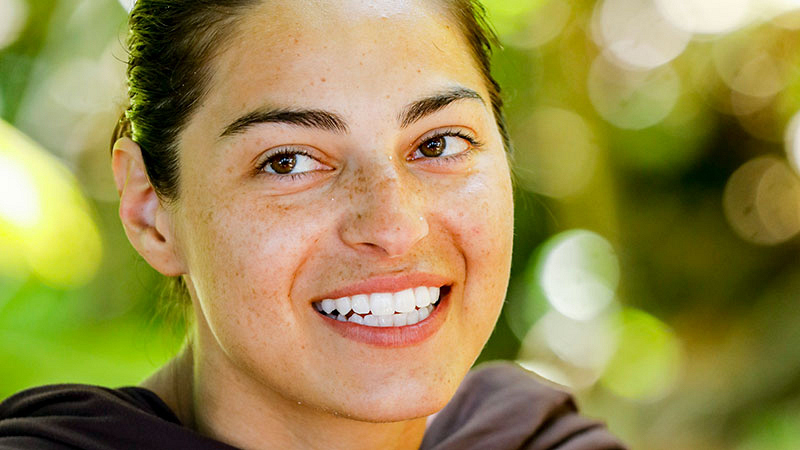 What would you say that you learned about yourself during your time on Survivor? Natalia: [Laughs.] I want to say I learned that I have a short temper but I knew this about me. I'm very self-aware. I just learned that sometimes it's better to hide your emotions. I always think it's good to be up front and open with people, but in the game of Survivor, you can't do that all the time. I had to be very calculated about when to show my honesty and when to hide it.